I have just compiled the list of the best and outstanding features of today's electronic market rocking gadgets, Apple iPad 2 and Blackberry Playbook. Few weeks before someone had told me that the Playbook is also one of the great gadgets launched recently. 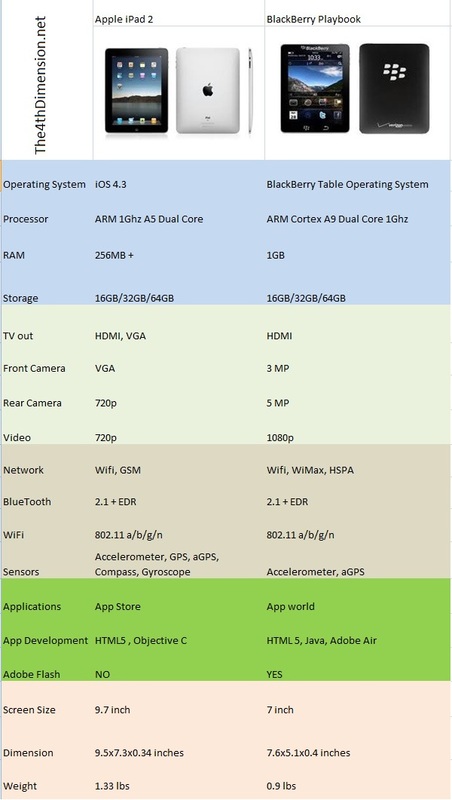 So I took some efforts to compile & compare its features with Apple iPad 2. Lets take a look. Apparently from the comparison it seems that the winner is Apple iPad 2, but we must not forget that this iPad is second launch of Apple tablet computer in the tablet market. Apple already had launched iPad earlier which would have surely failed in front of Playbook. but whats the difference between the price of two??? but I think Playbook will be lower priced than iPad 2.